Right now, at the MIT Media Lab, RISD the d.school: Institute of Design at Stanford, and NYU's ITP program, graduate students are tinkering, designing and making at the edges of technology with tools that we can only imagine, as well as tools that we have had at our sides for ages. Here in New York City, children at places like Beam Center and the Makery are working to understand component parts of technology --circuitry, sodoring, programming, robotics-- in combination with a multitude of design techniques to "make" their way to innovative implemenation of powerful ideas. Taken together, there is widespread agreement that makers represent an important future direction for education -- a perfect combination of tools for scientific and design innovation and 21st century skills like collaboration, flexibility and creativity. Since our inception, Blue School's DNA has been infused with the spirit of making. Three of our founders (Chris Wink, Matt Goldman, and Phil Stanton, the founding Blue Men) used a variety of materials and big ideas to build Blue Man Group, and a show that comments critically and creatively on our society. Then, as now, we understand that children need to own and make their ideas real using the academic, social and technical skills we teach in school. In many ways, Blue School assigns a 21st century exclamation point to the education research that informs our work, as well as shoots off a question mark about what is next and how we can keep getting better. A lot is going on with our makers at Blue School right now, and we are building the scaffolding for more to come. Next week, our second graders will be learning to fly (almost). Working with a visiting faculty member from Beam Center (who is a tinkerer, woodworker, artist, and robot-maker in his own right), our seven and eight year olds will build a glider together. Their idea to build a glider emerged from studying birds and looking at DaVinci's observations, designs, and artistry. In kindergarten, children are building houses, vehicles and hotels to redesign our neighborhood which is still struggling to recover after Sandy (yes, more than six months later). They are using tubing, soil, wood, and other materials at various scales. In first grade, children have built a classroom-sized wooden Rube Goldberg machine, and are working diligently to add, take away, and explore to see how things move, fall down, and stand up. They are scientists and tinkerers, asking questions, failing and trying again. They discuss how machines can have an impact on the world. And, what's next? We are bringing the practice of making to a new level at Blue School by working to codify a sequence of specific skills and experiences children need to be innovators and makers in the era of digital technology. If we aim to graduate 21st century inventors, engineers, and creatives, then school must be a laboratory where children can test out and experience those roles now. Thanks to conversations with people like our esteemed Advisory Board member John Maeda, president of RISD, Jon Santiago at HTINK, Mike Fischthal at Pixel Academy, Brian Cohen at Beam Center, and Deb Windsor at Construction Kids, and influences from books like Design.Make.Play and MakeSpace, we hope to make the conversation around integrating and teaching 21st century skills broader, louder and more visible by developing maker spaces and experiences at Blue School that give our children access to the same types of thinking that is happening at the graduate level. Posted on May 8, 2013 by Allison Pell and filed under Uncategorized. I’m thrilled to announce guest bloggers Molly DeGesero and Richard Jenkins, the teaching team of Kindergarten B. At Blue School, we think a great deal about how children develop not only the skills but also the agency to become active and purposeful readers and writers. In the post below, Molly and Rich show how literacy (as well as so much else) begins with children's natural inclination to tell stories. Every day in Kindergarten, children walk into the classroom filled with ideas, excitement and energy. It is our job as educators to watch the children at their work: play. When children play, they tell a story. They tell stories based on their lives, their experiences, their hopes and their dreams. A play theme of family might tell the story of a little girl lost in the woods found by her faithful puppy and returned to the safety of her home. Another story might begin with Ninjas conquering the bad guys of the world and transform into a peaceful meal around a common table. As we observe, we think about ways for children to document and record the stories they create through play. This year, Kindergarten B had the opportunity to visit ConstructionKids, a child centered woodworking lab in Brooklyn, where we created wooden vehicles. When we returned to Blue School holding our vehicles proudly, we naturally went back to the work of children: we needed to play with them! 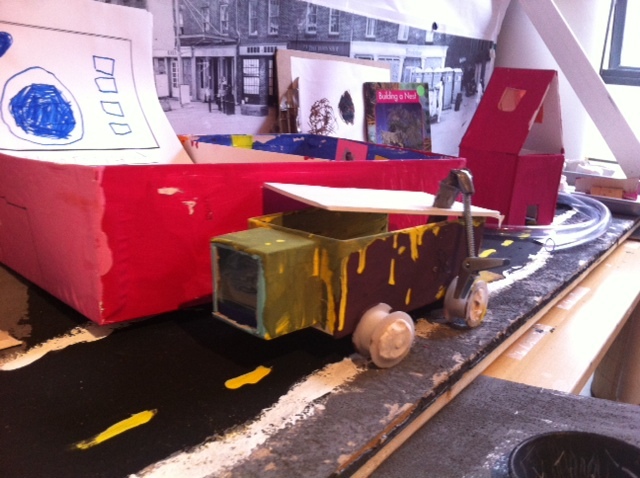 After painting them with Glow Paint and playing with them in various environments from the Glow Hall to our own classroom, we elevated elements of story embedded in their play with these vehicles. We asked the children to create story maps: Who drives your vehicle (character)? Where does your vehicle drive (setting) and what does your vehicle do (action)? With our story maps and vehicles in hand, small groups of children ventured out into our Construction Lab to “play the story of our vehicles.” Children first sat in a circle and looked through their story maps, but like any good author plans change once you begin writing! A story map including an adventure in the forest changed when the vehicle met another vehicle that took them into an elaborate city dwelling. Children's social interactions influenced the kind of stories they were telling! At this moment, we supported the children in documenting and saving their stories. Once they had finished playing, they sat around the computer and dictated their “vehicle story” to a teacher. Children listened to one another’s stories with care and intention. They were excited at the twists and turns taken and even remarked that what they played wasn’t necessarily the story that ended up being told. Below are two sample stories from this experience. Once upon a time, there was a car that had lots of friends. She was thinking, “Why can’t I go somewhere else?” Finally, she wanted to go somewhere and that included the places she was close to. Then she remembered that the closest places were where there was nature. Then she thought, “Why can’t I build a road there so I can go whenever I want to?” “I’m going to build a road so I can get there.” She made friends with animals. Then the animals needed to get to places. She brought them there. I am a car, which lives in a house. I am a normal car but I fly and swim in rivers. I have three friends, one is named Orion, one is named Dino and one is named India. I can do most anything. But I can get stuck in rain. I have the power to travel anyway but I cannot die. I stick with what I know. I believe in what I see. I made my life about recycling and keeping planet earth clean. I live in a recycling plant made for cars with an area with really nice beds and jumps and everything. I love to go visit my friends India and Orion. Dino comes to visit me. Not the other way around. I have one more question. Think up some more please. Posted on April 26, 2013 by Allison Pell and filed under Uncategorized. I am jealous of the children at Blue School. Because they take off their shoes in the morning as though they have just come home. Because they begin their day by entering into a safe, joyful circle of friends, and even sometimes dance and sing to start their days. Because then, they get to read, to laugh, to delve into books about families, or “greedy apostrophes,” or the One and Only Ivan, about triumphs, the history of the world, or about the possibilities for Lego. They get to talk and think about these books. Because they play through their stories and ideas, and then write them up, talking deeply with friends and teachers about their ideas and their work. Because during their days, they discuss revolution, the difference between work and play, the best way to build a ramp for speed, how electricity really works, how to make a map or a graph, how to find out who counts, where our food comes from, or what it means when a fish market in lower Manhattan is torn down. Because they can take a puppet parade into the streets and sing loud enough so that the whole Seaport can hear. Because at two and three, they rub their hands in shaving cream all over the tables and themselves in glow lights, and people around them smile, instead of telling them to stop. Because when they have an idea, someone is right there to listen and ask questions about it. Because they are transforming a classroom into a forest. Because they write well and articulate their grand thoughts; because they can argue a point. Because their teachers write about them with admiration and appreciation between the lines, and collect their work with them to archive it so that they will forever have a story of learning to share. 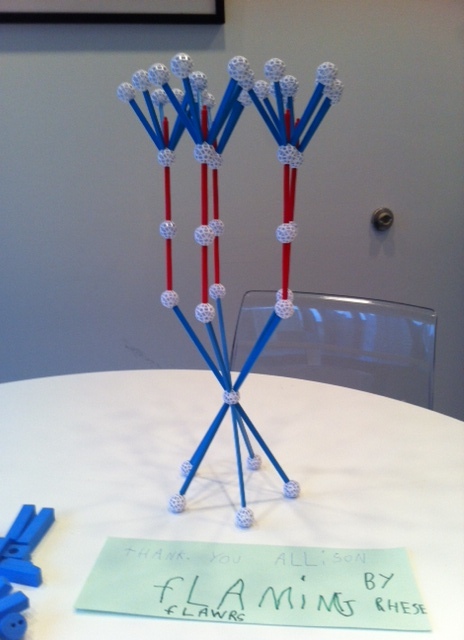 Because they can make imaginary castles and skyscrapers, as well as forts and art installations with their blue blocks. And then they can knock them down with the confidence that they can build something new. are at the center of a great education. Because they are deep into Howard Zinn. Because we have stealth artists who change the Andy Goldsworthy-inspired installation on the 5th floor every day without being noticed. Because they challenge one another’s thinking about numbers, and problems, and give each other feedback, and actually – even at 3 years old – reflect on their work. and make a ding in the universe. I often think about what it is that gets in the way of a national commitment to change the way we educate our children, given that everything we know about the brain says that children must discover, and play, and solve complex problems. I wonder if it is the powerful results (Williamson’s "light") that we see when it happens, and the potential for real, potent voices of all kinds, and shapes and sizes to emerge and to challenge our what-has-always-beens. Do we have what it takes to allow for a generation of children to grow up with the sharp and clear determination as well as the capacity to challenge us all to be better? 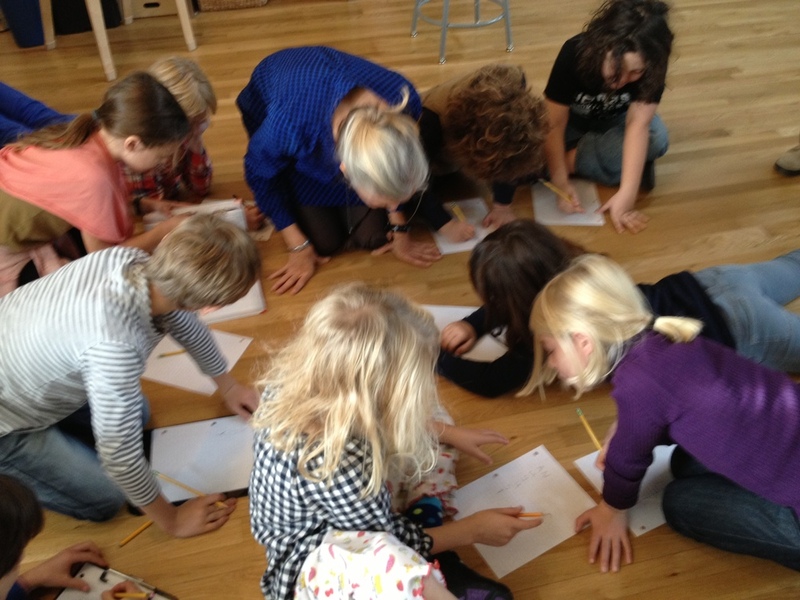 For us at Blue School, it is an honor and a privilege to spend our lives pursuing the connection between what we know about children’s learning and our educational practices, and to reconnect that which we all say that we want – a more sustainable and harmonious world – with our daily lives in school. Posted on February 1, 2013 by Allison Pell and filed under Uncategorized. a model of my city. Bridge making shadows in the water. see the taxis driving fast like a cheetah. see the ice skaters at Rockefeller Center. So you can climb a skyscraper. Posted on January 14, 2013 by Allison Pell and filed under Uncategorized. This week began with a powerful moment as we all gathered for Community Meeting after last Friday's events in Newtown, and heard the first grade lead us through Woody Guthrie's "Why Oh Why" and then our fours sing "This Little Light of Mine." As we ended our meeting in quiet reflection, we held our children tight and were thankful, our hearts full as our thoughts wandered to those who are now without loved ones, and for the despair and anger that events like those at Sandy Hook summon up in us. And yet, as educators and parents we are charged with helping to look forward, and that is what we did at our Winter Celebration on Thursday. From our 4th graders' two-part a capella Dona Nobis Pacem to the K-2 flash mob accompanied by the tunes of the Trans Siberian Orchestra to the community-wide singing of Auld Lang Syne, it was a moment, as one parent said to me, that Blue School was most profoundly itself. Moments later, families wandered the building to see the ways that children made the learning of their semester visible. They wandered up the "Tower Where Wintertime Lives" an installation of children's letters to winter with a recording of their voices resonating throughout the stairwell; they demonstrated their knowledge of bridges and how to build them, wrote poetry about the definition of beauty in a changed neighborhood, modeled art installations on the work of Andy Goldsworthy, explored the impact of water and wind during a hurricane, and much more. It was such a pleasure to see all of you there, and we wish you all the best, and a powerful, enchanting 2013. Posted on December 21, 2012 by Allison Pell and filed under Uncategorized. From the story, Crow and Weasel, by Barry Lopez (1998): Remember this one thing, said Badger. The stories people tell have a way of taking care of them. If stories come to you, care for them. And learn to give them away where they are needed. Sometimes a person needs a story more than food to stay alive. That is why we put these stories in each other's memories. That is how people care for themselves. 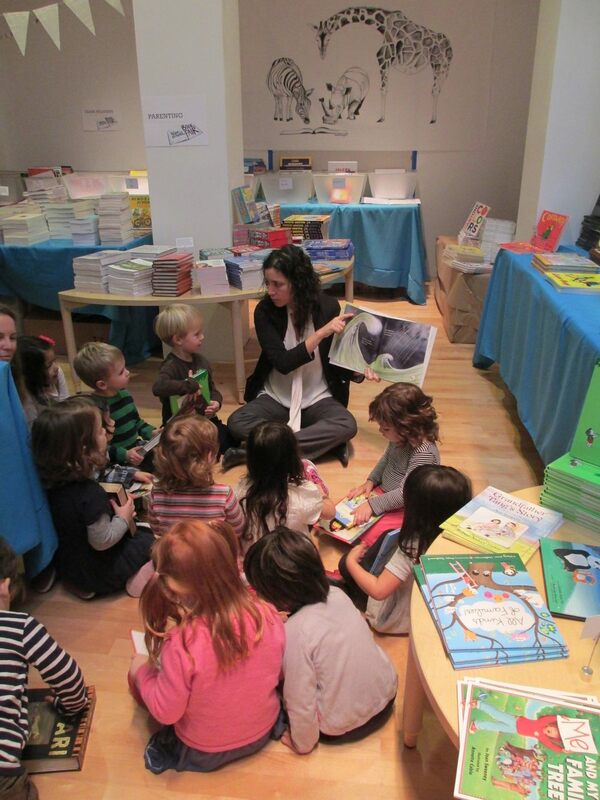 Last week was a week about books and stories at Blue. On Tuesday night, after months of hard work and incredible organization by dedicated parents, our Activity Space was transformed into the Blue School Book Fair where a wonderfully curated collection of titles for the littlest to the biggest (grown up) readers were on display for the choosing. It was irresistable, and I had to go back day after day just to settle on which books to buy and to explore it fully. During these few days, we had visiting authors reading throughout the grade levels, including those from outside and from our own staff as well. It was a deliciously literature-filled week, worthy of the Badger. Please see pictures! Posted on December 11, 2012 by Allison Pell and filed under Uncategorized. Over the past few weeks, we have been preparing for our Make the Road by Walking meeting, which we held last night to give parents a clear understanding of Blue School's status and where we are going. In general, I believe so strongly that we need to show more than tell, so I prepared a short video to illustrate the types of wonderings and questions our children have each day in our school. So, to wit, a day in the life of questions at Blue School. And it's true: here, when a child wonders (do horses sneeze? where do dreams come from?) we respond with a set of paints and a big sheet of paper. When a child cries, a friend goes to help. When children ask questions about a devastating hurricane, about friendship, about plants, people from the past, we include those questions in our studies. When it is time to look at their progress, we ask them to speak first. Children are, most profoundly, at our center and our core. They are known. And seen. We push, respond, and listen. We play. And here’s the thing. While good educators have instinctively known for a while that play is productive, we now know that it’s actually a requirement for learning – indeed, at its best, learning IS the best kind of play (joy, engagement, passion and people) all the way through. So, we play because of the way it changes the brain to handle complex experiences, to consolidate new ideas, and to increase insights and creativity. We play because then, when children get to interview the elderly of the Seaport or discuss the nuances of the American revolution and its causes, they can do so with the flexibility they need to understand and consolidate their learning. We do it so that they can learn about boundaries with their friends and with grown ups too. So that when they read the Odyssey in 5th grade and study the hero and its match, the innocent, they can create and apply complex theories to the world they see around them. Just as they will in early adolescence when their brains change as or more rapidly than they do from 0-3, and they become the big and critical thinkers that we all know them to be. Play is not about lessening expectations – it's the opposite, in fact. Every minute that children play, they are preparing for reading and writing, connections and ideas, becoming resilient, collaborating, and building relationships and meaning. Posted on November 20, 2012 by Allison Pell and filed under Uncategorized. On Monday night, we held our breath as pictures revealed a terrifying reality in the South Street Seaport neighborhood and at our school. The entire neighborhood, subways, and so much of New York City flooded. The warnings, speeches and predictions of the past could not have prepared us for the reality of facing a flooded and severely damaged New York City and east coast. Since Tuesday afternoon, our team has been onsite gutting and rebuilding our first floor, throwing out many items, the hardest of which was the student work that we'd carefully stowed in a newly organized storage room on the first floor. We have been incredibly lucky and awed by the showing of community support and love we've seen over these days, and to have an incredible staff to be reckoned with. Staff members and parents who had no power, heat or place to live came within hours on Wednesday morning to help pull documents, materials and furniture from the building. And at the end of the week, I am tired but proud of our school and its wonderful people, and even more urgently focused on our mission. The flood in our city is just the beginning: the climate is changing quickly, the global landscape is interconnected in a way that requires incredibly creative, flexible and complex thinking. We have no more time to tinker around the edges. The national conversation about education feels in many ways like a diversion from the reality that, in most educational contexts, we are not even close to educating young people in a way that matches the complexities of challenges we face. I hope that in schools (and I know that at Blue School), we will allow children to grapple with questions that emerge from cases like these: how do government leaders respond when faced with a complex challenge like this? what about more informal leaders or groups within communities? who counts in the recovery? how can a city or a government divert resources from one place to another? how do we decide what to do first? what could we do to better prepare our coasts for increasing flooding and topographical changes? how would a city exist without basic services? how can we cultivate compassion, service and the desire to hear one another out in our culture? and after all, how does a community make change? If we give children the chance to ask and answer hard questions as a daily practice--the chance to try out a solution in theory and learn from failures--they will be hard wired to pose answers to the questions that will come to them in their lifetimes, the likes of which we can only imagine. Posted on November 4, 2012 by Allison Pell and filed under Uncategorized. A few Saturdays ago, I attended a talk by Paul Tough, the author of How Children Succeed: Grit, Curiosity, and the Hidden Power of Character. Tough is the author of the much quoted New York Times article What if the Secret to Success if Failure? The book is an extension of the article, and the case for the importance of character in the success of children. If you have time, read the book, but if not, here are a few thoughts that made me think of our children and our school. First, relationships and attachment matters. I know that I am preaching to the choir here, but it is worth mentioning that scientifically, we understand that the ways that parents and children attach during childhood provide the secure base from which children can feel empowered to explore. Second, Tough reminds us, some adversity helps to build resilience, perseverance and grit. Paul Tough writes about a kind of U curve. When scientists asked a cross section of people to identify incidents of adversity, he found that (predictably) those with high incidents of adversity in their lives often faced incredible challenges as adolescents and adults. However, he notes that those who had no incidents of adversity also struggled a great deal. Those who were the most successful in work and relationships as adults had 2-5 incidents of adversity growing up. These experiences with mistakes and even failure helped them build resilience, perseverance, and ultimately character. While obviously, no parent wishes for adversity for their children, it is important to know that these experiences are key factors in the pursuit and attainment of happiness, success, and meaning in their lives. In the minutia of the everyday classroom, we take this stance towards risk, mistakes, and setbacks. While we want to give children tools to keep getting better and practicing, we also have to be willing to let them struggle and fall a bit, and be there to help them get up and try again. One example of this was a moment I observed in a classroom today. A child had made a mistake yesterday which caused upset and hurt among classmates. A discussion took place among the class, and the child apologized for stepping outside of the bounds of what the children expect from each other. In turn, each child put their hand over their heart, looked this young person in the eye, thanked him for his apology, and said that they'd forgiven him for his mistake. What an important lesson to learn that mistakes happen, are hard, incur feelings from other people, and can be resolved and learned from -- for every child in the class. Third, and related, is grit. It is a bit of a buzzword these days, but the meaning Duckworth (the originator of "grit," and TedxBlue speaker) posits is this: perseverance in pursuit of a passion. As I mentioned in an earlier blog and in my remarks at our event earlier this year, we are working on praise for effort and practice, and on searching for the best combination of an open ended exploration of ideas with a disciplined approach to fleshing them out. That is, how can we embolden children to pursue their passions by exposure and explorations in many domains and through many lenses, but also provide them with practice and discipline in those pursuits so that they can notice a shortcoming, a place to work harder, or a next step? How can we help them persist rather than give up? When we speak about the Blue "bubble" which I have heard some here do, it makes me think. In so many ways, school should be a bubble where warmth, engagement, and curiosity reign, and some of the harder things we face as adults are kept at bay, and yet I also believe that school can and should be the place where we test out our mettle, learn from conflict and struggle, understand multiple perspectives that look different from our own, and wrestle with sometimes hard moments. I'd love to hear from those of you who have read or are reading this book. It's a great, fascinating read, and one that I think underlies much of what we consider here each day. Posted on October 11, 2012 by Allison Pell and filed under Uncategorized. I was listening to an almost founding parent recently who spoke about how moved he was by the idea that the school was founded as a place where we "treat each other with just a little more consideration than is usually evident out in the 'real world.'" He said that at its origin, there was a sense that not only would community members bring Blue to our classrooms and families, but also out into the world. I believe that treating each other with a little more consideration means pushing each of us to be our better selves each day. For our children, we host a daily morning meeting where children greet one another, look one another in the eye, and share thoughts, ideas, wonderings. Do we do that well enough as adults? We ask children to reflect and consider how our differences make us stronger. Do we value difference as adults, or seek sameness? We ask children to try on the lenses and perspectives of others. Do we consider the lenses of our colleagues, friends, teachers, families? We ask children to ensure that no one is teased, ignored or put down, that they seek to understand and treasure one another. Do we do this consistently at work, at home, and with each other at school? We ask children to speak directly to one another when a problem arises. Do we speak directly with one another enough? We ask children that when they make mistakes with others, to make it right with the person they wronged. Do we spend time hearing each other out? For me, it is lifelong work each day to hold myself to the standards of respect, excellence, and joyfulness that I (and I think we) have for our children every day. I hope if nothing else, we instill in them the sense that this will be a lifelong project, and that practice with focus, meaning, joyfulness, conflict, relationships, setbacks, and pursuit of knowledge is what we do in school. I have that hope for all of their grown ups as well. Posted on October 4, 2012 by Allison Pell and filed under Uncategorized. This week, two small questions became big in kindergarten and first grade, which is what we all want great questions to do. In KA, children were asked to consider what they already know already about numbers. Next in 1A, two children cornered me in the stairwell: "How many days of school are there?" I responded that I had no idea (why should a Head of School know something like that!?) It launched an investigation that started with examining cubes in their classroom. Now, 1A is immersed in a deep exploration of how cubes can be used to answer this very relevant question. They made a plan: they looked at the school calendar, counted the number of days in each month, created each month with cubes, and then attached them all together. The small group then recruited the entire class into the research because different groups were getting counts that are not the same. As one student shared with everyone in reflection, "Maybe the whole class can help!" Students used a calendar to figure out how many days we are in school each month. One child shares with the class that it was "really hard work." Two students began to count of all of the cubes that represent the days that we are in school each month. One student is excited when the count is finished and the number is over 100! Another student's idea to count by 10 to see if we can get a number that always comes out to be the same. One child shares: "Our numbers are different again!" Today, I heard they have a final answer! Posted on September 27, 2012 by Allison Pell and filed under Uncategorized. One of the most important aspects of teacher work in a lab school is action research, which is the process through which teachers create, explore and implement new ideas. During the Summer Institute over the past few weeks, we began a deep dive into the question of creativity, and how we can cultivate and capture it in our classrooms. When you come to Orientation today, you will see some of the initial thinking about this inquiry on the walls of the Commons (formerly known as the MPR). Two days to go! See you soon. Posted on September 4, 2012 by Allison Pell and filed under Uncategorized.